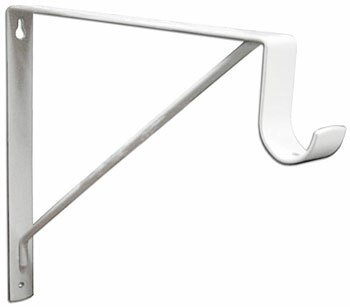 This 12" heavy-duty fixed rod and shelf bracket is for use with closet rods with diameters up to 1-3/8" and has a hook depth of 2-1/2". It is intended for use with 11" to 14" deep shelves and has a shelf platform of 11" deep. A pair of these brackets will hold up to 500 lbs. when properly installed. Install on 16" stud centers for maximum support.